Unique Gifts for Woodworkers and DIY Enthusiasts! No matter if you are a seasoned professional woodworker or a weekend DIYer, choosing the tools you are going to use is very personal. There is something about finding a tool that perfectly fits into the hand, and can be manipulated to show off your craftsmanship and care. So, when it comes to buying tools for a woodworker as a gift, my advice would be to steer clear, unless you know exactly what the recipient is looking for. However, to pick out some gift ideas, I’ve looked at some of the best accessories available that can meet all kinds of budgets. How often has it happened to you when you’re standing at your workbench, or up a ladder, and a screw escapes from your grasp and falls to the floor. The search can take valuable time away from your project. The handy magnetic wristband makes the search for a replacement that much easier, as it is sitting on your wrist. But it isn’t just screws the wristband can hold. The cuff has 16 built-in impressively strong neodymium magnets which can hold not just screws, but drill bits, washers, nails, and even a small pair of scissors. The magnets are secure enough to hold many items in place, and yet they can be easily removed by hand one at a time. The wristband is made of durable nylon with a padded mesh which is breathable on the reverse side. 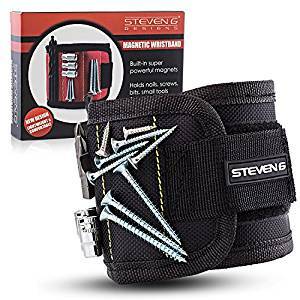 The Velcro straps give enough adjustment for the wristband to fit most sizes of the wrist or can be used to attach the band to a work belt. The Steven G wristband comes with a 100% money back guarantee if the purchaser is not satisfied with the product. The band will be replaced or a refund given no questions asked. Glue by definition is sticky stuff, and if you’ve ever inadvertently left the top off a bottle, you’ll know it can dry out quickly and be a devil of a job to unstick. That’s why any woodworker will thank you for giving them a FastCap Glubot glue bottle as a present. 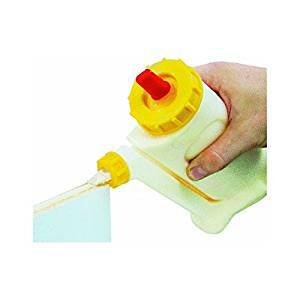 The design of this apparently simple bottle has been praised for the easy way glue can be applied; how the glue can be distributed in just the right amount in exactly the right spot. If your woodworker uses lots of glue in their projects, the chances are they will be buying it in bulk, and decanting into smaller containers for application. The GluBot is ideal for woodworkers or DIY enthusiasts who take their carpentry seriously, and need to apply glue to furniture precisely. The GluBot comes with a range of tips that can release different amounts of glue for each specific task a woodworker may have on their workbench. The bottle’s wide mouth makes it easy to fill, and its sturdy base heavy design means it will not be easily knocked over in a busy workspace. The goal of any level of craftsman is to create something that is useful, sturdy, and handsome. There are very few things that can be made from a single piece of wood. Most have to be made with individual pieces which must be joined together in some manner. Joinery is the art of piecing bits of wood together and is one of the skills necessary to be a good woodworker. But what makes a good joiner is the clean and aesthetic look of a join. An untidy joint can detract from a piece, and make it look ugly, unfinished, or unsafe. Traditionally, a joint could be formed using a dovetail, or a mortise and tenon. Both of these need a level of skill that comes with practice, which many inexperienced woodworkers have yet to gain. However, a professional joint can be achieved with this simple tool. 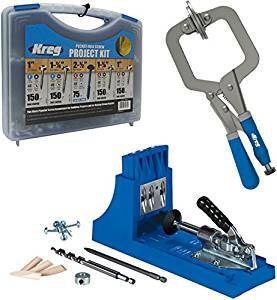 The Kreg K4 Pocket Hole Jig makes the joining of wood pieces so much easier, and aesthetically more pleasing allowing screws to be recessed deep into the timber. The jig clamps wood in place, so pocket holes can be drilled using the guides. The system is simple and straightforward and is a tool welcome in the workshops of experienced woodworkers through to newbie DIYers. A drill bit is a drill bit I can hear you say, and they’re all pretty much the same. Well, to the uninitiated, that’s probably true, but to anyone who takes pride in their work, all drill bits are not the same. What makes the Forstner drill bit special is its unique geometry which means it can cut a hole with a flat bottom and leaves a clean rim and smooth walls. 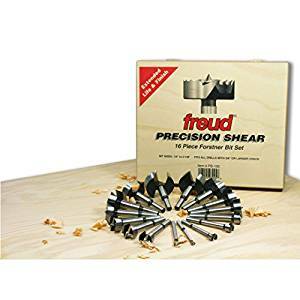 The drill bit is designed to cut rather than tear at the wood and is guided not by the center but the sides of the bit. Hence, they leave a clean exit and are therefore great at drilling through holes. These versatile drill bits can create angled holes when used with a drill press, also holes that overlap, and holes at the edge of a piece of wood or other material. These properties make the Forstner bit ideal for drilling the overlapping guide holes for a mortise joint. When trying to drill a large hole, they provide a cleaner cut alternative to a spade bit, or a hole saw. They say a craftsman is only as good as his tools, and if they aren’t sharp enough, he or she will never get the job done right. Getting a good sharp cutting edge on a chisel or a plane can take skill and time. 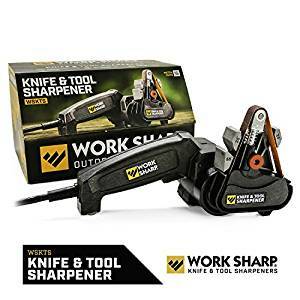 The Worksharp 3000 sharpening system makes it easy for even the amateur DIYer always to have the sharpest tools in their box. The machine is designed so an average woodworker can repeatedly sharpen chisels and plane irons using the rotating abrasive platen. The abrasives stick to the platen and can be changed out to various grades. Users recommend buying extra platens to make the change over that much quicker. The recommendation is to take the sharpening process slowly so as not to burn out the abrasives. Taking that into account, sharpening tools could not be simpler and more consistent, even if you spend hundreds of dollars more on a professional machine.